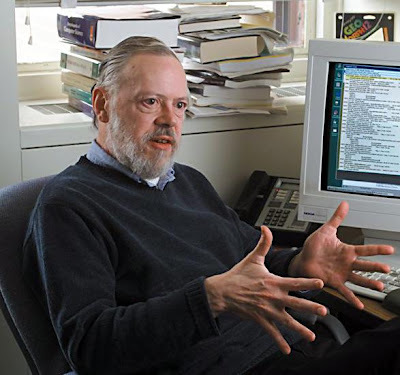 Dennis Ritchie, an American computer scientist notable for developing C and for having influence on other programming languages, as well as operating systems such as Multics and UNIXhas died at age 70 according to his longtime employer, Alcatel-Lucent's Bell Labs. Ritchie was born in Bronxville, New York. His father was Alistair Ritchie, a longtime Bell Labs scientist and co-author of The Design of Switching Circuits on switching circuit theory. Ritchie graduated from Harvard University with degrees in physics and applied mathematics. In 1967, he began working at the Bell Labs Computing Sciences Research Center, and in 1968, he received a Ph.D. from Harvard. He received the Turing Award from the ACM in 1983, the Hamming Medal from the IEEE in 1990 and the National Medal of Technology from President Clinton in 1999. Ritchie was the head of Lucent Technologies System Software Research Department when he retired in 2007. Ritchie was found dead on October 12, 2011 at his home in Berkeley Heights, New Jersey where he lived alone. The cause and exact time of death have not been disclosed, but it was known that he suffered from prostate cancer and heart disease.